A few wild new products. I’ve just called this mascara in from Avon for one reason, which I think will become evident when you see this clip. That’s right: because it makes me giggle. No, no, I mean because I am curious regarding the design. I’m all for innovation, and that brush might just be the best thing any of us ever apply mascara with, so let us not judge until we have wonder painted, yeah? I’ll let you know how it goes. Another product that intrigues me but which certainly sped past intrigue right into necessity for a lot of you, is Nanoblur, $30, which has been the number one selling product in Priceline since launch in January. 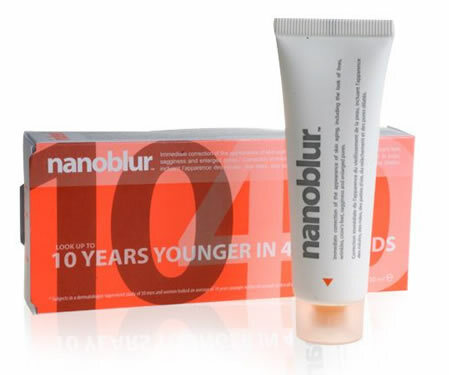 Nanoblur claims to make “people look 10 years younger in 40 seconds,” which I think would be fascinating to see on an 11-year old. Essentially it ‘blurs’ lines and wrinkles, you see, using, light reflective particles. A bit of soft-focus in a tube, if you will. It feels and looks like a primer, and as if proving it’s not skin care, but an optical illusion product (for those liable to be confused) you use it after your makeup, and dab it onto crow’s feet, marionette lines, the forehead, etc. To be crude, it’s cosmetic Spakfilla. There have been a few of these come out over the years, L’Oreal and Clarins both did similar products, but none have sold so phenomenally as this. The lines seem a little less obvious but the best part is that unlike the oils and balms I tend to use for this issue usually, Nanoblur won’t make your makeup move and slip. In that sense, you can pretty much use it in place of sheer finishing powder to take away shine, mattify, reduce imperfections, and make your makeup stay in place, which is important if you get shine or your skin eats your makeup like mine does…. It’s a kind of finishing primer, if you will. I am considering mixing a little in with my foundation next for an all-over blur. Why not! Why not indeed. Have you tried Nanoblur? What did you think? Also, I love your hair like that.